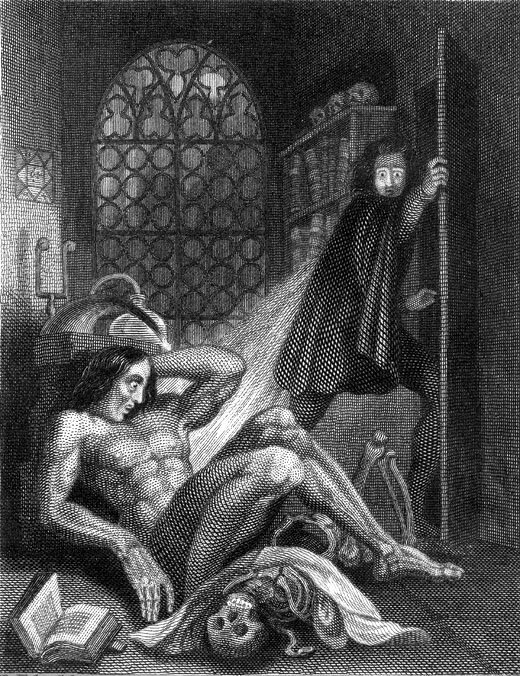 The gothic novel Frankenstein; or, The Modern Prometheus was first published anonymously in 1818 in London. Mary Shelley started to write the novel when she was just nineteen and the story was published when she was twenty one. The story is so well renowned that there is no point in summarizing it here; I think it is difficult for any child to reach six or seven years old without gaining the knowledge that the story is about a scientific experiment gone wrong when Dr. Frankenstien creates a man (cue the visual of a lightning striking animating the monster). Like Bram Stoker's Dracula, the story has become part of modern culture. We discuss the genre in our Gothic Literature Study Guide. In an interesting historical coincidence, Jane Austen also wrote Sense and Sensibility at nineteen as well. Return to the Mary Shelley library.